My experience of creating what might be termed ‘indigenous’ ceremonies is an ongoing feeling-in-the dark experiment, an emergent feeling into what is needed, and what is wanted in the moment as well as a direct response to the land that I happen to be set upon in that moment and the beings who are present – human and non-human. Without this reciprocity, I will risk saying, that a dishonoring is happening, or even that an exclusion is taking place. Within this reciprocity I will suggest that if we are creating or co-creating ceremony within the folds of our mother tongue then, if speaking is needed, this is surely going to be the most natural, ergonomic way of addressing the other-than-human, as well as the human, realm. And if speaking isn’t needed then let the prayer, or song, or gesture be one that is aligned to the very essence of what is emerging in the moment, one that is a direct response to whoever is in the ceremony with you, be it spider, owl, moon or rock; not one that is prescribed from another language, another culture from a far away land where the plants, rocks and four leggeds are nothing like the beings you now find yourself amongst. For these are the ones who inspired the language in the first place and this could be the very thing that makes it ‘indigenous’. As Francis Weller writes in his book, The Wild Edge of Sorrow, ‘Psyche….is shaped by and is rooted in the foundation of nature’. I have added this in a previous blog but I feel compelled to share it again here, Weller goes on to write in the section What is Ritual?, ‘While we have much to learn from indigenous cultures about forms of rituals and how ritual works, we cannot simply adopt their rituals and settle them neatly onto our psyches. 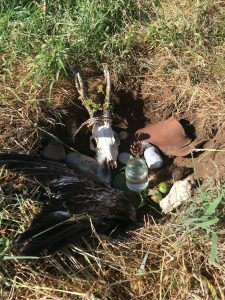 It is important that we listen deeply, once again, to the dreaming earth and craft rituals that are indigenous to us, that reflect out unique patterns of wounding and disconnection from the land’. To return to my feeling-in-the-dark process; nobody showed me how to create ceremony that is befitting the land from where I come. I have not had training in this and I do not consider myself an expert. I have watched those that I admire and I have taken notes, internally. They role modeled well, still do – I’m always learning. I have received some extremely good mentoring and more than any of these, I have spent time ‘listening’ to land, to the other-than-humans and to myself. My relationship with the land and how the Otherness wants to offer Itself is the biggest teacher for me. Faith in my ability to connect and express myself from that connection is how I began, and continue, to be in ceremony. For me, it is an imperative that we find our own unique and authentic way of being in this conversation because anything less is not coming from the most creative and empowered version of ourselves. I will suggest that the earth longs for us to claim our birthright to be here and that that is part of the healing from our displacement from Her is needed in order that, as a species, we can co-exist with other species and live in a harmonious way, rather than a destructive one. If you are exploring for yourself, or with others, being in ceremony then I offer to you to check if it is coming from a place of feeling as if you belong to this earth. I’m suggesting here that to be indigenous could also mean to simply belong to the earth, as well as to a specific land-base on the earth. Is your way of being in ceremony one of knowing your place in the ‘family of things’ and trusting your connection with the earth? To claim this enough (and sometimes just the hint of it really is enough as part of the journey to fully claiming it) is to feel your own way in the dark and to speak from that place that knows (or trusts somewhere deep inside) that you belong. This is a gift of and from Wholeness to a fragmented world. It takes courage, I know only too well, but it is this courage that will bring us back into knowing our place as an earth community and as empowered humans being and belonging and there is healing in this; healing that is both personal and collective and I believe that’s exactly the kind of healing the earth needs right now.